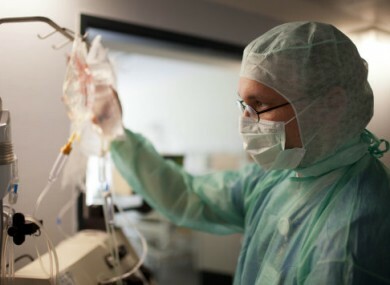 Dr Hauke Weilert prepares a kidney dialysis for an E.coli patient at Asklepios Hospital in Hamburg-Altona, Germany, on 6 June, 2011. GERMAN OFFICIALS have reported a slight drop in the number of reported infections as a result of the recent major E.coli outbreak. Twenty-three people have died from the illness; 22 in Germany and one in Sweden. The New York Times reports that Germany’s health minister Daniel Bahr said there was “much to suggest that we have put the worst behind us”, although the country’s disease control centre said it couldn’t “currently be determined” if the reduction in new infections would continue. Farmers across Europe have reported a downturn in sales as people turn away from vegetables thought to be connected with the outbreak. EU Agriculture Commissioner Dacian Ciolos said he would propose the provision of €150m in aid to farmers adversely affected by the E.coli outbreak at yesterday’s emergency meeting of EU ministers. The ministers backed the proposal. However, the source has still not been found. Yesterday, an infectious diseases expert at the World Health Organisation warned that German authorities had only about a week left to find the source of the outbreak. Dr Guenael Rodier said that by then, all of the related contaminated produce will have left the market, cutting the link between the source of the contamination and the patients. USAToday reports that the outbreak is also deterring some US tourists from visiting Europe. Email “Germany optimistic about falling E.coli infections”. Feedback on “Germany optimistic about falling E.coli infections”.